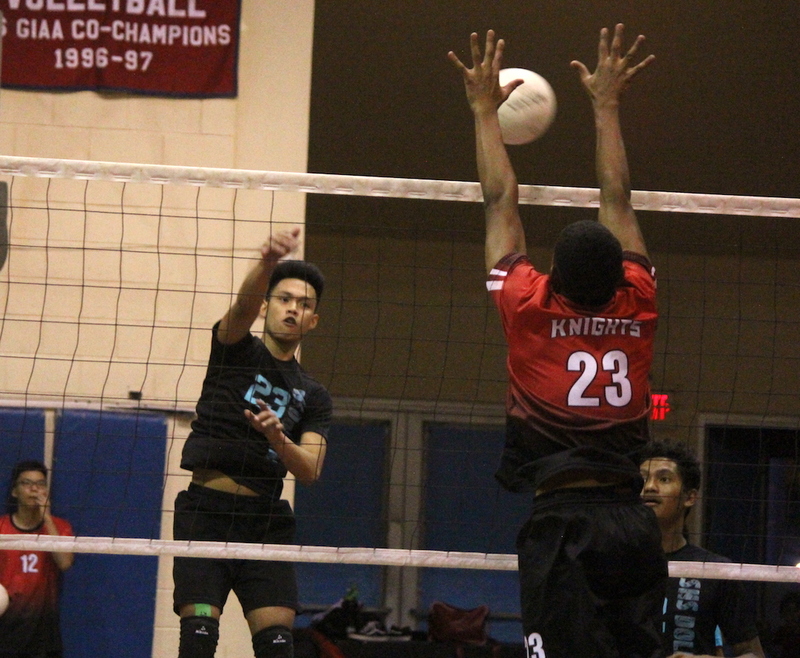 The Southern Dolphins have put their early season losses behind them as they powered through the St. John’s Knights in straight sets 25-11, 25-19 in Tuesday nights IIAAG Boys Volleyball action. The home team Knights fell victim to their own errors as the Dolphin offense didn’t skip a beat. Leading the way for the Dolphins was outside hitter Phil Jardeleza, who finished with seven total kills with five coming in their dominant opening set. Jardeleze credited the smooth functioning play to his teams ability to find the best in their competitor. “We stay humble and we treat every team we face the same way. We don’t underestimate anyone,” said Jerdeleza on facing the Knights. Jardeleza added two more kills in the 2nd set along with an ace and a block to round out an all-around effort in the stat sheet. The Dolphins raced out to an early 17-7 lead with Jardeleza and middle blockers Austin Elm and Keoni Duenas grabbing a pair of kills each. Isaac Sim registered a kill and a block for the Knights, but Jardeleza put the finishing touches with a monstrous spike to the back line of the defense for the 25-11 opening set win. The 2nd set featured a more competitive setting with the Knights gaining an early 7-5 advantage off of big plays from CJ Ishizu and Sim. The Dolphins didn’t stay down for long as the two teams traded leads before the Knights would gain one last advantage 14-13 off a Sim block. Southern recollected themselves and played error free volleyball with the Knights faulting on hitting and service errors. Southern held a 24-16 advantage before a pair of aces from the Knights kept things interesting. A final hitting error did the Knights in, giving Southern the 25-19 final. “We still have a lot to work on as far as our defense, but we’re slowly getting there,” added Phil. The Knights will travel to FD Wednesday while the Dolphins will head up north to face the Okkodo Bulldogs.